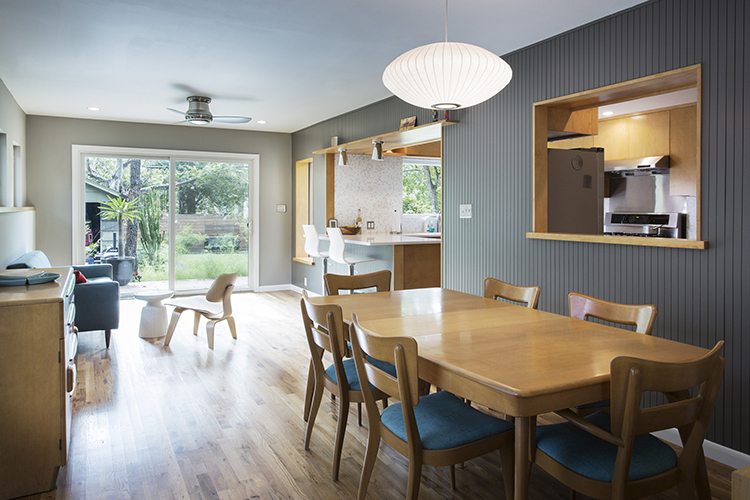 Built in 1950, Lloyd and Kirsten Thompson's Austin house had "some inherent mid-century charm and good flow," says architect J.C. Schmeil of Merzbau Design Collective. An addition, however, had been poorly done in the 70's—it was out of level, uninspiring, and made no connection to the backyard. So the couple hired Schmeil to remodel the addition, hoping to better connect the living area to the kitchen, dining area, and lounge; and to open the lounge to the outdoors. The result is a thoroughly modern space that looks as good as it functions. Click through the slideshow to learn more. And check out Dwell.com's Rooms section for lots more kitchen inspiration. Owner Kirsten sourced some Eichler siding for the wall separating the lounge and the kitchen, and painted it a cool grey-green color which nicely offsets the warm maple cabinetry and the Heywood-Wakefield dining set. "We widened the opening between the living room and the dining room, keeping the existing doorway but cutting out a portion of the adjacent wall," says Schmeil, who worked with contractor John Edmond. "In order to still give a bit of separation and privacy from the street, we added a screen of vertical wood slats." The original kitchen, pictured here, was outdated and needed some modern inspiration. The firm also leveled the floors in the dining room and lounge, and added new oak flooring. "We took advantage of a strange offset in the wall framing to create a continuous wood picture ledge on one wall," says Schmeil. New windows and a sliding patio door bring in the light and give the house a strong connection to the new ipe deck and lawn area. Owners Kirsten and Lloyd chose a muted mosaic tile from Modwalls to cover the backsplash and back wall of the kitchen. New cork floors from House + Earth give a nice feel underfoot. Perforated chrome lights from Rejuvenation under the bar soffit enhance the mid-century vibe.